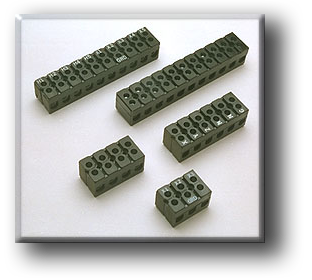 Eagle Connector B-Series terminal blocks were designed to provide reliable, versatile, and cost effective wire connectors in rugged industrial equipment and commercial appliance applications. The B-Series is used as a power connection point for loads up to 85 amps. The B-Series is also used in low power applications where large wire, as large as #4 AWG, is used to minimize voltage drop. We can print markings on individual circuits as an option in the B-Series terminal blocks.